The university's more than 1,300 endowments provide funding for scholarships, professorships and programs, among other things, in perpetuity. Becoming an endowed faculty member is a never-forget-where-you-were moment. When it happened to Lynn Goldman, she was making pies on Thanksgiving in 2013. She'd just finished the crusts when philanthropist Mike Milken, benefactor and namesake of the then-unnamed Milken Institute School of Public Health, called her. "That's when he told me they had made the decision to make this first gift," Dr. Goldman says. "Kind of a down payment on the whole thing." Dr. Goldman was installed as the Michael and Lori Milken Dean at the Milken Institute School of Public Health in January 2010—it's a rare endowed deanship—following what would ultimately be an $80 million combined gift from the Milken Institute, the Sumner M. Redstone Charitable Foundation and the Milken Family Foundation. "It's an honor, the highest of the honors a university can bestow on a faculty member," Dr. Goldman says. "Having endowed professors elevates the reputation of the university, [it] helps recruit better faculty." The university has more than 1,300 individual endowments, which provide for scholarships, programs and professorships, among other things, in perpetuity. In the case of faculty members, endowments provide an annual funding boost that can be used to fuel research or other initiatives. GW added another endowed position in October, the Max Ticktin Professorship of Israel Studies. Funded by a grant from the Morningstar Foundation, the family foundation of Susie and Michael Gelman, the position honors longtime Professor of Hebrew Max Ticktin, 93, who retired in 2014. Elsewhere in the fall, three professors were installed in endowed positions: James Wade in the Business School (Avram S. Tucker Endowed Professor in Strategy and Leadership); Ahmed Louri in the School of Engineering and Applied Science (David and Marilyn Karlgaard Professor); and Robert H. Miller of the School of Medicine and Health Sciences (Vivian Gill Distinguished Research Professor). Dr. Goldman, a noted epidemiologist and pediatrician and a former Environmental Protection Agency administrator, says her endowment was the result of about a year-long process that became final six weeks after Thanksgiving. She says she uses it to fund student scholarships and faculty research. 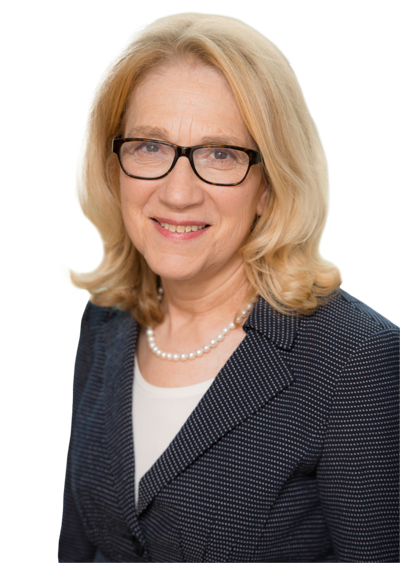 "I know that those younger faculty members are not going to get their first grant from the National Institutes of Health unless they're already bringing in some preliminary data," she says. "This is money that can do that." The year the university's oldest endowed professorship, the Congressional Professorship, was created by an act of the U.S. Congress. The number, approximately, of individual endowments, which provide funding for an entity—for example, a scholarship, professorship, a program, a library—in perpetuity. The sum of a university's endowments are part of its total endowment. 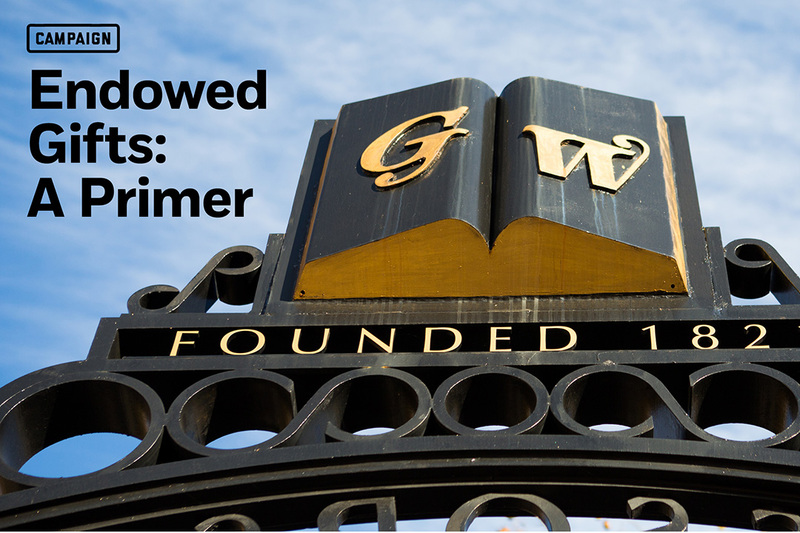 As of June 2015, GW's endowment was $1.616 billion. The minimum gift to create a named endowment. The minimums for a professorship, department head and deanship are $1 million, $5 million and $10 million, respectively. The average rate, approximately, at which endowments pay out annually. For example, a $1 million endowment would yield $50,000 per year in funding. The rest accrues interest, which funds the endowment in perpetuity. In FY15, distributions from the endowment, in total, were $73.7 million. Matt Manfra, GW's new head of alumni relations, offers some highlights. More than 100 GW alumni, parents, prospective students and other guests mingled during a November afternoon of food and wine pairings in San Francisco. Read updates from alumni and submit your own.